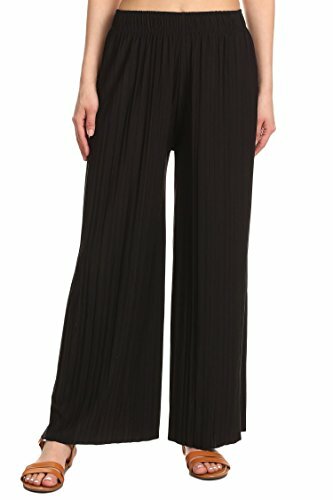 TL Women's Versatile Comfy Wide Leg Long Boho Maternity Palazzo Gaucho Pants will provide the maximum comfort you need! It's time for Banded High Waist Palazzo Gaucho Pants in many colors! TL women's palazzo pants are a Must have for a fashion lover and also a great flattering pants for every occasion. Top Legging is one of the fastest growing fashion online store for women and men's fast fashion apparel. FABRIC COMPOSITION: Our wide-leg palazzo pants for women are available in 3 different styles & fabric options. Please refer to color option. Fabric 1- Black, Charcoal, Heathered grey, Navy, Wine, Purple, stone, eggplant, pale lime are made from a blend of 96% of Rayon and 4% spandex. Fabric 2- Black, Charcoal, Moss, Rose-pink, and Ocean blue is a blend of Polyester fabrics. 79P - is a blend of 67% Polyester, 28% Rayon & 5% Spandex. COMFORT FIT: High Waisted palazzo pants for women comes with super comfortable wide leg pants, elastic and soft material that provides all-day comfort for expecting mothers. If you have any questions about this product by TOP LEGGING, contact us by completing and submitting the form below. If you are looking for a specif part number, please include it with your message.